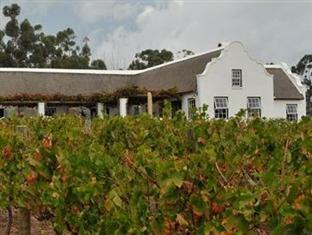 ﻿ Rijks Country House Tulbagh. JIMAT di Agoda.com! Ada soalan mengenai Rijks Country House? Ketika melawat Tulbagh, anda akan merasa seperti di rumah di Rijks Country House, yang menawarkan penginapan berkualiti dan perkhidmatan hebat. Dengan lokasi hanya 2.0 km dari pusat bandar dan 119.0 km dari lapangan terbang, hotel 4-bintang ini menarik banyak pelancong pada setiap tahun. Bagi anda yang ingin pergi agak jauh, Crystal Cave, Lemberg Wine Estate, De Oude Kerk merupakan beberapa daya tarikan untuk pelawat. Di Rijks Country House, segala usaha dilakukan untuk membuatkan tetamu berasa selesa. Oleh yang demikian, hotel ini menyediakan perkhidmatan dan kemudahan yang terbaik. Pengemasan harian, pendiang api, Wi-Fi percuma semua bilik, kedai cenderahati, fasiliti tetamu kurang upaya merupakan beberapa kemudahan yang membezakan Rijks Country House daripada hotel-hotel lain di bandar. Semua bilik tetamu menawarkan pelbagai jenis tahap keselesaan. Banyak bilik turut menyediakan televisyen skrin rata, internet wayarles, bilik larangan merokok, penyaman udara, pemanas untuk memuaskan hati tetamu. Hotel ini menawarkan kemudahan hebat, termasuk pusat kecergasan, sauna, kolam renang terbuka, memancing, spa, untuk membantu anda berehat selepas hari yang penuh aksi di bandar. Apapun alasan anda untuk melawat Tulbagh, Rijks Country House adalah tempat yang sempurna untuk percutian yang menyeronokkan dan menarik. 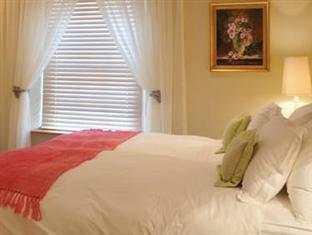 Well located hotel with excellently linked cottage style rooms overlooking vineyard. Fantastic breakfast. Dear David Thank you for your review. Tranquil location with views over the vines. Spacious well equipped room. Excellent breakfast but the price of dinner prohibitive..
Dear David Thank you for your review. Sorry that you could not afford dinner. The buildings in Cape Dutch style are beautiful, the location is quiet, outside of the town, with a splendid view on the surrounding mountains and vinyards. Staff was very friendly and helpful. Breakfast outside was beautiful and eccellent, and dinner was very good, especially in combination with the wines produced on site. Dear Matthais Thank you for your review. Truly fantastic experience. The room was great with a luxury bedroom. Views were stunning and the general vibe was relaxed and stress free. We weren't expecting much due to the cheap room rate, but really became the highlight of our trip around the Western Cape. I recommend it without hesitation! Perfect for our sightseeing purposes and very affordable. friendly, with nice surrounding (vineyards). we even had our car washed! Very Good. We appreciated the tach roof of our bungalow and the surroundings. A pity we were there for just a night! Fantastic, uneventful, pleasant - would love to have stayed another few nights. We had a lovely thatch-roofed, spacious and comfortable bedroom with a huge underfloor heated bathroom (especially welcome as there was snow on all the surrounding mountains), but the service in the dining room was really poor - especially at breakfast. Quite a few tables of guests were ignored by waitrons, they werent given menus and the orders took ages to come. With no particular waitron assigned to each table, orders got confused and it lead to some tables being ignored as waitrons thought someone else was looking after them?. At dinner we were placed at a table right at the reception desk of the restaurant where all the financial transactions were taking place - tables deeper into the restaurant were empty - including the tables near the fireplace. Although it was a cold weekend (it had just snowed) we were told there was no firewood for the lovely fireplaces in the dining room and none for the very cold lounge. Diningroom staff were not well trained, for example, they did not know when to remove dirty plates, they left dirty side plates from our main course for us to look at whilst eating desert - and neither were the room service staff well trained - we had no towels in our bathroom on the 2nd evening. It would also have been nice to have had a daily newspaper in the communal lounge area. Its a pity - it gives what could be an ideal romantic getaway hotel (in the most remarkably beautiful surroundings) a feeling of being old and tired and lacking interest in their guests. we love the view and surrounding..the family loved it so much, felt like we were out of South-Africa. Very special. 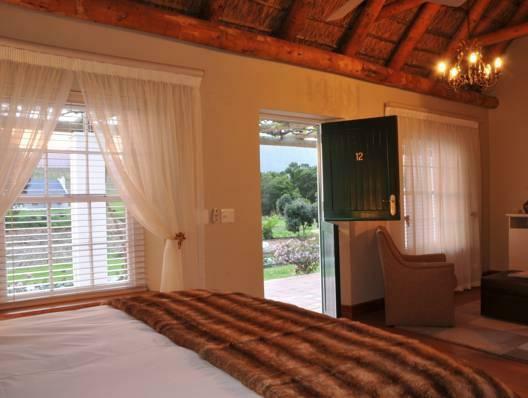 hotel located 1.5km outside of tulbagh in beautiful country setting with fantastic,well tended garden grounds surrounded by a vineyard.breathtaking views of the mountains in every direction. rooms set in blocks of four,large and exceptionally comfortable with a very modern and well designed en-suite bathroom including a double shower enclosure and completely separate wc.very attractive stoep (balcony)at entrance with table and chairs. staff very kind and helpful, really nothing too much trouble for them and very keen to ensure one had everything required to make for a pleasant stay. choice of restaurants at the hotel and, as the weather was clement, we chose to eat on the terrace with vine covered pergola and lovely views of the mountains.lovely relaxation area in the garden with well tended swimming pool and comfortable loungers. food unfortunately not to the same high standard as the rest of the product. the menu is extensive and very reasonably priced with a good selection of local and national wines also very competitively priced. food always nicely presented ,enjoyable and served with kindness but not to the same gourmet standard that was available in the numerous restaurants in the village. free, reasonably fast wi-fi available throughout most of the hotel. very useful for travellers from overseas who need internet access. Servicegericht en vriendelijk, ook heerlijk gegeten en gedronken ( wijn) Gratis wifi, jammer dat we er maar kort waren. mooi hotel met kamers verspreid over het terrein. vriendelijk personeel. moeilijk toegankelijke wifi wegens tever afgelegen routers. lekker ontbijt en eten maat niet echt goedkoop.